Roberta K. Timothy (PhD in Adult Education, Community Development, and Women and Gender Studies, University of Toronto, 2007) specializes in the areas of intersectionality, critical human rights, and ethics in health work; health and race; transnational Indigenous health; and anti-oppression/anti-colonial approaches to mental health (including anti-oppression psychotherapy) and research methodology. She has extensive teaching experience in universities, colleges, and in social service organizations and community settings, with particular expertise in critical health theory, art-based praxis, and social justice health policy development and implementation. Critical and creative approaches to knowledge production that reflect experiences and aspirations of migrant, refugee, African/Black diasporic, and transnational Indigenous communities are prioritized in her work. 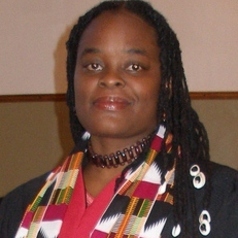 Her scholarship contributes to critical race theory by examining how factors such as gender, class, sexual orientation, gender identity, disability, transgenerational connections, and historical and contemporary intersectional violence impact African/Black communities’ health and other ‘racialized’ communities, and by centering community resistance through innovative decolonizing health practices. She held an SSHRC Postdoctoral Fellowship at the department of Applied Psychology and Human Development at U of T, looking at the impact of Criminalization of Non-Disclosure of HIV Positive Status on Racialized (African/Black) communities from an intersectional lens. Currently, she holds a 3 year Assistant Lecturer position at York University.